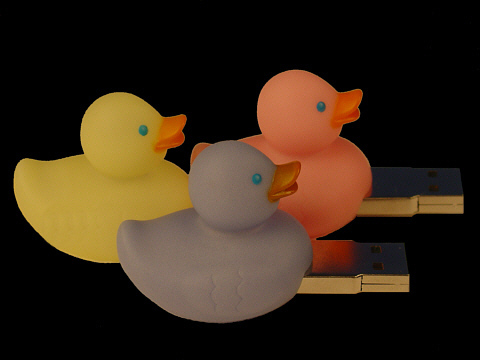 USB i-Duck is a flash drive storage device for your archives, back-up, documents, i-tunes, movies, music, and photos. It's powered by the computer's USB port: so doesn't need feeding. It's cute, useful, and only 37mm long, beak to tail. USB i-Duck has a soft plastic glow-in-the-dark body in pink, yellow, orange, blue, hearts, camouflage, or transparent, and a tiny USB flash-memory module which lights up when it's busy. It needs no installation, uses no batteries, and works with any modern PC or MAC. Using A USB Flash Drive. A USB solid-state memory device, sometimes called a USB flash drive, memory key, memory stick, or thumb drive, can hold thousands of documents, spreadsheets, photographs, or music tracks. To use it, just plug it in. The computer recognises it, adds it to its list of drives, and gives it a temporary drive letter, for example E. When you unplug it, the computer knows it's gone, but doesn't interfere with anything else you're doing. You can write data to it by saving your files and read from it by opening your files, in the usual way. When you've finished working, just unplug it and use it on any computer. The simplicity of USB makes it a true plug-and-play system. You can take it anywhere as your personal memory bank, or use it to share or swap any type of data. If you want to use it for backup or as an archive storage device, keep it somewhere safe. Sometimes, manufacturers include free applications such as FlashMail, Mobile Lock, or SecretZip. If you look in Windows Explorer or My Computer, you can find them, open the folder, and experiment. Alternatively, just delete them. USB Cables And Extension Leads. Sometimes it's not be easy to get to your computer's USB sockets. They might be at the back, very close together, or some distance from where you sit. There's a selection of USB cables and extensions in the on-line shop. You can move your xBox 360 profile, or transfer downloaded maps or skins, on a USB drive. However, the USB sockets are recessed and it's hard to plug in and remove a small drive. It's easier to plug in a cable and just work with the free end. The module has a bright steel case which contains a circuit layer, a formatted flash memory chip, and a USB 2.0 interface. It takes power from the computer's USB port, so doesn't need a battery or a mains adapter. It can be used with an extension cable, up to 5.0 metres, or a multi-port USB hub. It needs a standard USB port, but no manual installation or configuration. USB 2.0 allows a maximum data-transfer rate of 480 Mb/s: 480 million bits a second. Like all USB 2.0 devices, it also works with older USB 1.1 sockets. If your computer has limited RAM, USB flash memory can improve the general performance of Windows: a feature called ReadyBoost uses the plug-in flash memory as extra system RAM. The raw text on this page needs about 12KB, a jpg photo about 60KB, and an mp3 song about 4MB. So a 2GB module can store over 160 000 similar pages, or over 33 000 photos, or over 500 tracks.